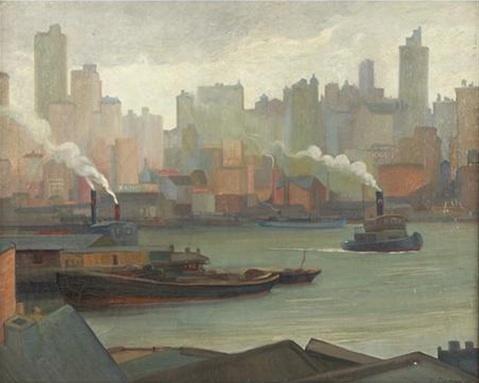 “East River Scene” by American painter Elias Ben Delman gives us smoke-spewing tugboats, murky blue-gray water, and a Manhattan skyline that seems obscure and awfully far away. This painting has something subdued yet magical going on. I wish I knew more about the artist and the scene he chose to depict. This entry was posted on January 20, 2010 at 5:24 am and is filed under Brooklyn, Music, art, theater, Transit. You can follow any responses to this entry through the RSS 2.0 feed. You can leave a response, or trackback from your own site. Yes must be a secluded private painter. His biography doesn’t say much at all. that is a nice one..
Elias Ben Delman was a Public Works Art Project painter, and later a Works Project Administration Artist who signed his paintings “Ben Delman.” His name and address are cited in a PWAP Government Report dated 1934 (Region 2. Address: 2800 Bronx Park East, NYC, NY). Photographs of Delman’s WPA/FAP-sponsored art, circa 1940-1941,are in Archives of American Art (Smithsonian) records (R: 1163). The Rochester Young Scholars Academy at Geneseo, NY, has several FAP/WPA oils by Delman in its collection, titled “The Goldfish Globe,” and “California Fruit,” 24” x 30” and 24.5” x 29.5”, respectively. (This short bio is from a 500+ page biographical dictionary of New Deal artists I’ve been working on for the last 4 years). He was my grandfather. We have over 60 of his paintings and are searching for more of them. I have a 6×8 black and what was once probably white sketch or etching which depicts several windmills in what is possibly a farm setting. It hung in my parents’ home since at least the 1930’s. It is signed, in pencil, E. B. Delman. Might this be the work of your grandfather? Yes Rosalie. He did do etchings. Could you email me a photo of it? He’s wonderful and left a beautiful artistic legacy. Thank you for your kind words. We’re developing a proposal for a retrospective exhibit of his artwork. Sharon, I’d love to speak with you about your grandfather’s work, specifically this piece. I’m working on a television show here in NYC and we would love to be able to get permission to use this piece on one of our sets. Please feel free to contact me: publicmoralsart@gmail.com.